Has been in my house. It can be dangerous . When the music breaks the rigid diagrams, lighten your step. And in that transit you choose their companions on the journey. It is the tradition by releasing their networks to allow ourselves to be free to undertake new sound expeditions. The baritone saxophone of Oleg Hollman is a roar in calm, or better say, a ballad and therefore misleading, splendid. The prevailing 'decomposition' music that provides the cd “Theme and Dances”, their permanent breaches melodic, their changes of pace, its rich abstractions, concentrated his force, leads us to this beautiful site of the french intellectual Michel Onfray: "The reality is poliform, the history of the music, like any history, is an arborescent and rich in outreach also revitalized multiple". Shotgun Chamber Trio is the intrigue aesthetics present in "Mood for Love", a film by Wong Kar-Wai, with its beautiful treatment of the images (close-ups and panning) and that is projected in topics such as "The tenant-main theme" (their instances ludic and line-up became somewhat), "Is iste in schnnitter heibt der tod " (the beautiful opacity of the abstract), or "Theme # 17" (with the guitar by wrapping, decorating, bringing color and new rockers). The calm of the baritone sax seems to be 'shaking' something to the inside of each item. An earthquake musical that seduces sharply. What we have to preserve is that music does not fall into "the danger of becoming devoid of danger," said the philosopher Theodor Adorno. 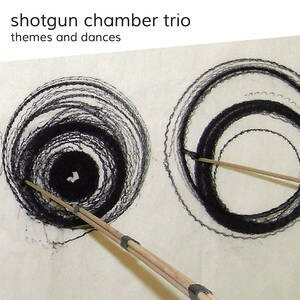 In this instance musical, Shotgun Chamber Trio" plays to the textures that uplift, fascinating to the wound in "Spiritual", or the tone of rural anglosajon tradition in "Where did you sleep last night". This production, “Theme and Dances”, uses the structural ingredients of contemporary music, his attitude of breaking parameters, not only in musical technique, but in consumption for their listeners. Oleg Hollman confers haze to the baritone sax, Hannes Buder makes the guitar a instrument plural, exasperating or calm, and Lucia Martinez, already known with its work with Baldo Martinez, owns its coup concise, its versatility of rhythmia blunt. And this is a way to believe in the 'danger that aesthetic’ bet on his discography Meta Records, of Germany: refreshes with anarchy, released with technical moves with professionalism. ¿Or is it that I'm wrong, this to live permanently in shock and musical sound, its plasticity, its aesthetics? ¿Could it be that my 'organs of the senses' are running out of its usual shaft? If perhaps I suffer from a kind of 'unravelling' perceptual, thanks to this litter of great musicians that scattered throughout the entire world their 'boiling' cheerful and libertarian, their sounds overwhelmingly beautiful. "Shotgun Chamber Trio" maintains its gaze to the society of the spectacle, acting, proposing, moving and working in his work, as they were in his time the taxi driver Philip Glass and the elevator operator Ornette Coleman, legitimize with conviction his musical activity, without the need to wipe out crowds. If life is a metaphor explicit, as said Schopenhauer, the music contained in Meta Records is a meditation explicit full of dazzling new archetypes sound. Stockhausen, well aware of this type of meditation, he said in his own way: "The common act of meditate -that if: letting themselves be carried away by sounds, timbres, rhythms or the most diverse types of musical stimuli - never ceases to be a private matter and with a degree of intimacy hardly calculable, and under no circumstances should be minted or degrade as a mere object of exposure". That keep flowing, forever, these glowing sounds…!!! Very cool session from the trio of bari saxophonist Oleg Hollman, guitarist Hannes Buder and drummer Lucia Martinez, who find a way to incorporate their backgrounds in jazz, folk and blues. This is avant-garde music that likes hanging out on the front porch and waving friendly to neighbors as they pass by. For the most part, all the tunes portray their quiet side, even as they muss things about randomly. This album doesn’t sound like much else out there, and that the trio can consistently express that unconventional form of expression throughout the length of the album is no small thing. There are some tuneful moments of a staggering beauty to be found here. Second mention in the Jazz Picks column in 2014 from drummer Martinez, whose Cuarteto put out a decent album over the summer (De Viento y de Sal). Ein abgeschossenes Gewehr und Kammermusik? Wie geht das zusammen? Das Berliner Shotgun Chamber Trio setzt auf den extremen Kontrast. Der Opener ruft noch das Echo einstiger FMP-Heldentaten in Erinnerung, doch schon im zweiten Track schalten Baritonsaxofonist Oliver Hollmann, Gitarrist Hannes Buder und die spanische Perkussionistin Lucía Martínez auf wesentlich sanglicheres Material um. Im Geiste enge Verwandte von Daniel Erdmanns Band Das Kapital, findet das Shotgun Chamber Trio teils beeindruckend organische, zuweilen aber auch überraschend absurde Verbindungen zwischen Abstraktion und Kitsch. Vieles klingt so vertraut, dass man – vergeblich – nach seinen Ursprüngen im bereits Gehörten sucht. Selten war freier Jazz so hymnisch, Liedhaftes so frei. Dieses junge Trio nimmt den Hörer mit auf eine Reise, die nach Airbag und doppelter Sicherung verlangt, denn man weiß nie, was einen hinter der nächsten Kurve aus der Bahn wirft. Und selbst wenn man es wüsste, käme am Ende doch alles ganz anders.